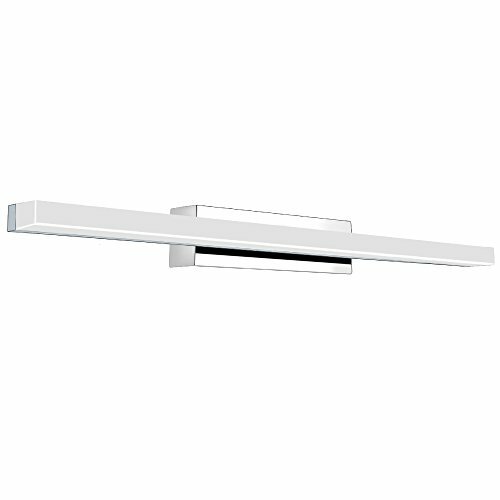 This vanity light adds an extremely modern ambience with chrome stainless steel hardware and white acrylic shades. Effectively improves heat dissipation. Use of top-quality acrylic lampshade, offers you stable,high illumination.Equipped with soft tube and flexible wires for an easy installation. Both ends of the light are sealed and moisture resistant,smooth like a mirror, so as to prevent water vapor and mosquitoes from getting in. Safe to use in bathroom, easy to clean. Built-in LED chip, gives out light evenly and soft, low stress on eyes. Three sizes are available to meet your different needs,representing noble,elegant design and excellent quality. Lighting Color: White light, close to natural light. Drill two holes in the right position on the wall, and install the hanging plate.For your safety, please be careful when using electric drill.If possible,it is recommended to find a qualified electrician to install. Well connect the reserved wires and power cable. Fix the light on the hanging plate with provided screws.The installation is completed. Highly efficient team. We are dedicated to constantly providing the best service to every customer and improving all aspects of our products. Quick response.You are supported with professional and efficient after-sales service. Whether it is pre-sale consultation or after-sales service, we promise to reply your every inquiry as quickly as possible. 18 Months limited warranty.If you have any problem with the product within 18 Months of purchase, please feel free to contact us. We will provide you with satisfactory solutions. 【New Design】Modern and minimalist slim design, chrome stainless steel base and rectangular white acrylic. For bedroom, it is a wonderful makeup vanity light. As the bathroom vanity light, it works well too. 【Easy for installation 】Fix the lamp base at an appropriate position, connect the wires, and then firmly fix the light tube on the base. 【Energy saving and safety 】These vanity mirror lights give cool white up and down light. There are 9W/12w/16w LED lights for you to choose. There are ROHS, IP44 Waterproof and CE certified for the LED power driver.LED saves up to 80% less electricity than conventional light bulbs. 【After-Sales Service】 When you receive products have any questions, please do not hesitate to contact us, we will give you the best solution within 24 hours, allowing you to rest assured shopping. If you have any questions about this product by YHTlaeh, contact us by completing and submitting the form below. If you are looking for a specif part number, please include it with your message.